By Ayaan Hirsi Ali – “We hear so often about Muslims as victims of abuse in the West and combatants in the Arab Spring’s fight against tyranny. But, in fact, a wholly different kind of war is underway—an unrecognized battle costing thousands of lives. Christians are being killed in the Islamic world because of their religion. It is a rising genocide that ought to provoke global alarm. The media’s reticence on the subject no doubt has several sources. One may be fear of provoking additional violence. Another is most likely the influence of lobbying groups such as the Organization of Islamic Cooperation—a kind of United Nations of Islam centered in Saudi Arabia—and the Council on American-Islamic Relations. Over the past decade, these and similar groups have been remarkably successful in persuading leading public figures and journalists in the West to think of each and every example of perceived anti-Muslim discrimination as an expression of a systematic and sinister derangement called ‘Islamophobia’—a term that is meant to elicit the same moral disapproval as xenophobia or homophobia. But a fair-minded assessment of recent events and trends leads to the conclusion that the scale and severity of Islamophobia pales in comparison with the bloody Christophobia currently coursing through Muslim-majority nations from one end of the globe to the other. The conspiracy of silence surrounding this violent expression of religious intolerance has to stop. 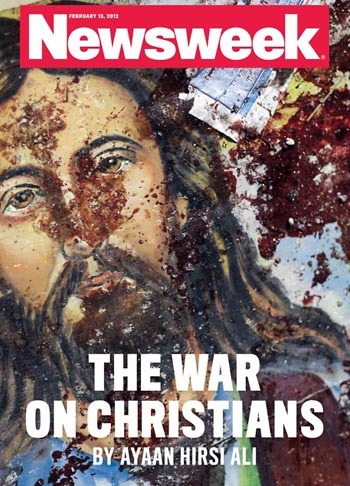 Nothing less than the fate of Christianity—and ultimately of all religious minorities—in the Islamic world is at stake.” Read more. ‘The Most Important International Story Not Being Told by the Mainstream Media’: Christian Persecution in the Middle East – “… former New York Times reporter Clifford D. May, writes that ‘persecution of Christians in numerous Muslim-majority countries is the most important international story not being told by the mainstream media.’… U.S. Commission on International Religious Freedom chairman Leonard Leo declared that Arab Christians face increasing persecution. ‘Christianity in Iraq could be eradicated in our lifetime, partially as a result of the U.S. troop withdrawal,’ Leo wrote. After Hosni Mubarak’s regime collapsed, 100,000 Christians fled Egypt in what the Egyptian Union of Human Rights called a ‘mass exodus.’” Read more.